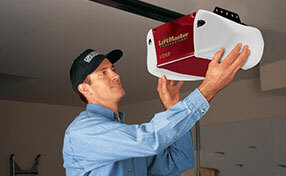 Electric garage door openers provide force to control how far a garage door opens or closes. Modern openers are designed with safety and security features for the benefit of consumers, since many garage-related accidents and even fatalities come from faulty doors. An electric motor is used to power an opener’s drive system. The latter could be a chain, belt or screw-driven system. This is connected to the door, using an arm that goes up or out as the door rises. Openers are controlled by wall mounted or wireless remote controls. Openers are composed of different parts that can be easily replaced when necessary. The talented team of “Garage Door Repair Tiburon” is always ready to provide service when you suddenly find your opener to be malfunctioning. With us, you can be confident that someone knows exactly what to do, regardless of the part at fault. It is because our technicians are well trained, and our combined experience makes us equipped to work with openers of any type or brand. Our team knows each part of the door opener and what they do. By fully understanding these components, they can provide expert repair. An opener has several main components, and these include the power head, drive mechanism, rail assembly, door arm, rail header bracket, carriage assembly, wall controller, door sensors and remote controller. The drive system is typically a chain or rubber belt. It moves along a rail and pulls the carriage to operate the garage door. The rail assembly supports the drive system, and provides the carriage assembly with a track. The carriage assembly on the other hand transfers power to the garage door from the drive system, via a door arm. It typically uses a release cord in case of power shortage. The door arm is responsible in pushing or pulling the door to open or close. Make sure your opener is working smoothly, for when it malfunctions, your family’s safety and security could be compromised. Allow Garage Door Repair Tiburon to handle garage door repair and you can have peace of mind. Feel free to call us no matter what brand of overhead door or opener you are using.